Who’s ready for another healthy and mouthwatering dessert? 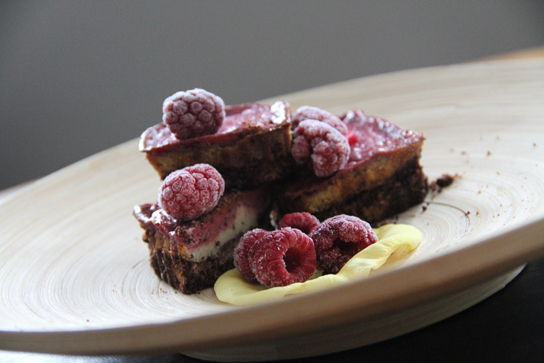 How about Mini raw vegan brownie cheesecakes bars? No cheese? No milk? No butter? Nope, nope and nope. Then what’s that in the “cheesecake”? Cashews. For people who love cheesecake and it’s creaminess, there probably isn’t a healthier alternative than this. Cashews are full of healthy fats such as omega-9 fatty acids, B vitamins, dietary fiber, and essential vitamins and minerals. Because of the high fat content, they contribute very well to the creaminess of the raw vegan cheesecakes. The larger than normal portion of lemon juice is also a must for the recipe because it substitutes the lost tangy-ness when cream cheese is not used. Place walnuts and almonds into the food processor and blend until the nuts are finely ground. Add cocoa, salt and blend again for 1-2 minutes. Slowly add dates while the processor is running. Work until the “dough” or mixture easily sticks together (if it doesn’t add 1-2 more dates). Line a cupcake mold with plastic wrap and press about 2 to 4 tbsp of the crust batter into the mold. How much is needed would depend on the size of the cupcake mold. Place the cupcake mold into the freezer to harden. Strain the cashews of any left over water; blend or process with lemon juice and vanilla. Heat together coconut oil and maple/agave syrup. Add into the cashew mix and blend until smooth. Try to avoid any chunks. Bring out the cupcake mold and pour enough of the fill to cover at least 1/3 of each mold. Place them back into the freezer for the layer to harden. Blend or process the left over mixture with raspberries. When the layer is ready, top up the cupcake mold with this raspberry cheesecake mix. Store them in the freezer. 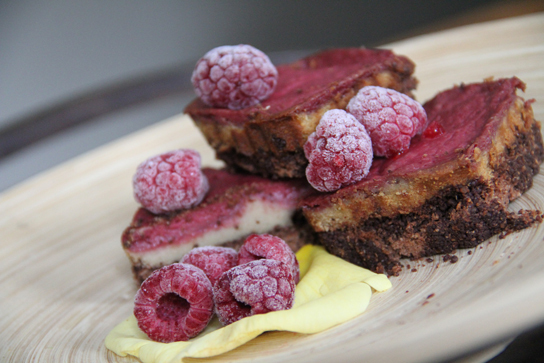 Defrost in the fridge 20-30 mins before eating and garnish if you would like with fresh or frozen raspberries.